In today's market a significant amount of "junk mail" is delivered daily and because most people have developed an eye to spot junk mail, it's usually thrown away without ever being opened and read. Over the past decade we have learned that mailing personalized letters in personalized envelopes are not discarded upon arrival like most junk mail. People tend to open and read personalized letters. If the letters are being thrown away then so is your money! People are not using the U.S. postal services like they used to. People now use the Internet to conduct the majority of their important and personal business such as banking, shopping, and communicating. Therefore the majority of the mail that is delivered to a person's home is primarily considered to be "junk mail". More than 70% of this junk mail will be discarded without even being opened and read. A personalized letter is generally noticeable from the rest of the delivered mail. When a person receives a personalized letter in the mailbox they are more inclined to open it and read it. People are so used to spotting junk mail that when they do receive a piece of mail that looks like a personal letter, they are less likely to throw it away without opening it first. iti Direct Mail takes pride in utilizing marketing techniques that are professional, effective, economical and sensible. 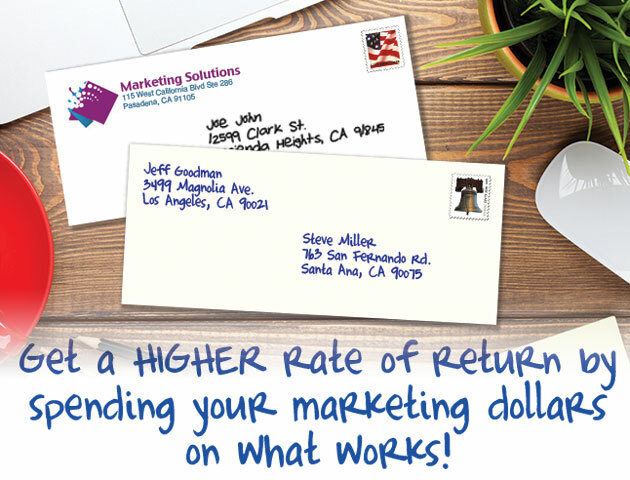 Use your marketing dollars wisely by using a targeted list with a personalized letter. Increase your ROI by getting the right offer to the right person. Mail merging techniques are used to print letters that personally address each individual reader. Personalized mail pieces are designed to create a feeling of familiarity with the reader. This is done by mail-merging relevant information about a reader's circumstance, from a targeted mailing list, directly into the body of each letter. All information from a targeted mailing list can be merged into the body of your letter to personalize each letter. For instance, in a mortgage mailing campaign the current interest rate, mortgage payment amount, and the new offered rate and savings amounts are merged directly into the letter. This will make the reader pay closer attention to your letter because they can see that the information provided in the letter is true and accurate of their current situation. The envelopes used to mail these personalized letters look just as personal. You can send a letter without giving it an appearance of "Junk Mail" by using a First Class "peel & stick" postage stamp. Printing the return address and the recipient's name and address directly on the envelope also works better than using labels or window envelopes. Additionally, real handwritten fonts work very well when used in printing your envelopes. Our Handwritten Fonts are fonts that have been created from an actual person's handwriting. This personal and professional approach will gain you more creditability which will result in a higher response to your mailings. When done correctly, direct mail marketing is still one of the most affordable and effective advertising mediums used to promote your products and services.